Download and share the flier. Traditional metamodel-based optimization methods assume experiment data collected consist of performance measurements only. 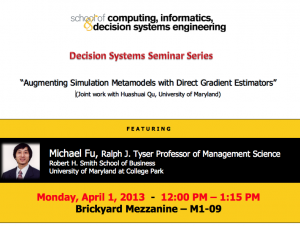 However, in many settings found in stochastic simulation, direct gradient estimates are available. We investigate techniques that augment existing regression and stochastic kriging models to incorporate additional gradient information. The augmented models are shown to be compelling compared to existing models, in the sense of improved accuracy or reducing simulation cost. Numerical results also indicate that the augmented models can capture trends that standard models miss. 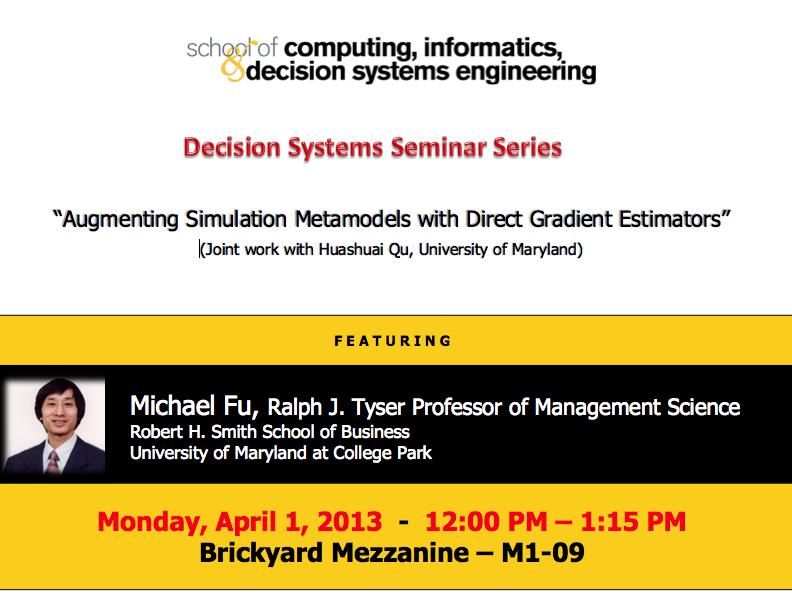 Michael Fu is Ralph J. Tyser Professor of Management Science in the Robert H. Smith School of Business, University of Maryland at College Park, with a joint appointment in the Institute for Systems Research and affiliate faculty appointment in the Department of Electrical and Computer Engineering (in the A. James Clark School of Engineering). He received degrees in mathematics and EE/CS from MIT in 1985, and a Ph.D. in applied mathematics from Harvard University in 1989. His research interests include simulation optimization and applied probability, with applications in supply chain management and financial engineering. At Maryland, he received the Business School’s Allen J. Krowe Award for Teaching Excellence in 1995, the Institute for Systems Research Outstanding Systems Engineering Faculty Award in 2002, and was named a Distinguished Scholar-Teacher for 2004-2005. He has published four books: Conditional Monte Carlo: Gradient Estimation and Optimization Applications, which received the INFORMS Simulation Society Outstanding Publication Award in 1998; Simulation-based Algorithms for Markov Decision Processes; Perspectives in Operations Research; and Advances in Mathematical Finance. He served as Stochastic Models and Simulation Department Editor of Management Science from 2006-2008, as Simulation Area Editor of Operations Research from 2000-2005, and also on the editorial boards of Mathematics of Operations Research, INFORMS Journal on Computing, IIE Transactions, and Production and Operations Management. He also served as Program Chair of the 2011 Winter Simulation Conference and as Program Director of the Operations Research Program at the National Science Foundation from September 2010 to August 2012. He is a Fellow of INFORMS and IEEE.